This wide-ranging book explores the diversity of esoteric and occult beliefs. Neo-Paganism is one of the fastest-growing new religions in the western world where witchcraft or Wicca, Druidry, and Urban Shamanism are thriving. Why this new interest in old beliefs? Why are millions of educated people today abandoning both the established religion of their parents and 21st century scientific rationalism and turning to magic and esoteric teachings? In their search for spirituality those who follow these paths claim to be applying ancient wisdom to the modern world. Utterly packed with over 50 chapters on everything from Theosophy to the Fraternity of the Golden Circle. Chapters on Alice Bailey; Benjamin Creme and Maitreya; I AM Movement; Emissaries of Divine Light; Findhorn; UFO and Millennial Expectations; Aetherius Society; Raelian Movement; Rosicrucian Fellowship; Hermetic Order of the Golden Dawn; Builders of the Adytum; Society of the Inner Light; Temple of Starlight; Clan of Tubal Cain; tons more! 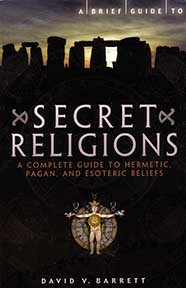 A BRIEF GUIDE TO SECRET RELIGIONS A Complete Guide to Hermetic Pagan and Esoteric Beliefs By David V. Barrett. 420 pages. 5x8 Paperback. Bibliography. Index.